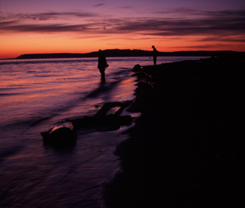 Sea-runs are our primary target, but silver salmon (coho salmon), pink (humpy) salmon and king (chinook) salmon are by-catch and catch and release. They all cruise the Puget Sound shallows in search of food. Sand eels, euaphisids and herring are a few staples of these anadromous species. Wading the shallows, casting and retrieving baitfish patterns is challenging, but has great rewards. Puget Sound Coho Salmon, Wash. This unique fishery combines challenging casting, tenacity and a keen eye. Arch Anglers will offer casting strategies throughout the day to make you more effective. Comb the beach along the way for sealife, and approach each fishing spot with short controlled casts. 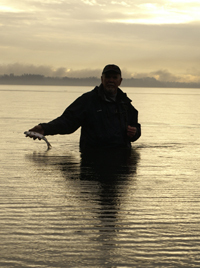 A forty foot cast at all angles is all you need, when tackling the Puget Sound saltwater fishing. These fish can be at your toes! A grilled lunch is provide on all FULL DAY trips. Demo gear is available upon request. 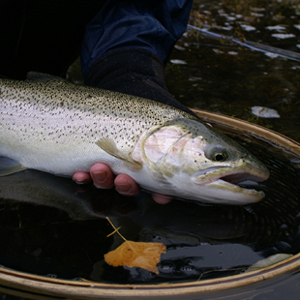 We are a hardworking team of fly casting instructors, fishing guides, photographers, artists and more. Home for us is the Emerald City of Seattle. 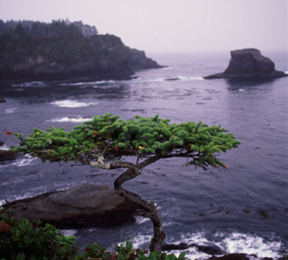 Fishing stimulates us, you the angler define us, and the rich nature of the Pacific Northwest relaxes and refreshes. The everchanging shores of the Puget Sound adjacent to Seattle is host to all sorts of prey. Our search for their predators begins in the shores of this estuary, with our focus on the Coastal Cutthroat. Casting lessons are available to those looking to get started with fly casting, or improve your current cast. Stay tuned for more information on these events. Please email for more information: info@archanglers.com or call 888-543-4665. 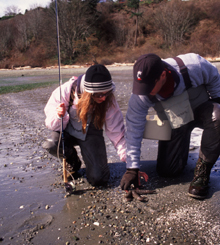 Double haul, or Spey casting lessons on a Washington river or beach are available on your schedule. Our instructors are FFF Certified Casting Instructors, or in training with fly casting intructors and guides around the northwest. In the summer, the mountain streams of the Puget Sound rivers are a great way to get away from the heat of the city. Wading the river is often required, but those looking to explore will find some beautiful places around Western Washington State. Those learning the ropes will be taught basic casts to make them as effective as possible. The best way to get your money’s worth is to come prepared on a guided trip. Casting lessons from Arch Anglers or your local shop will greatly increase your chances of playing and releasing a photo worthy fish. 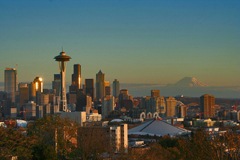 We will travel to anywhere in Western Washington to meet with your friends, family, students or corporate get-together. All we need is a field or gymnasium with lots of room for all attending.